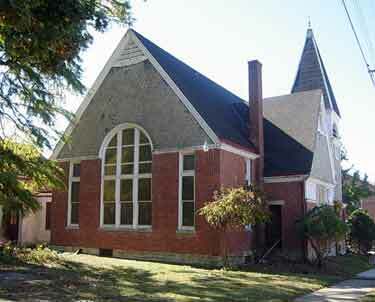 We offer at public auction this historic 19th Century church, located on a large lot at the corner of Gracely Drive and Twain Avenue, in the heart of Sayler Park. This church served the community for over 100 years. The primary structure was erected in 1866 and a large, stucco addition was added in the second quarter of the 20th Century. The church has many interesting architectural elements and is a most inviting space. All sanctuary windows are leaded glass and are original to the building. Enter the church into a small foyer with leaded glass windows and a hanging chandelier. The church bell rope invites you to ring the bell in the bell tower. Oak swinging doors with leaded glass open into the sanctuary. The vaulted ceiling with its ornate oak crossbeams give the room an open and airy feel. Four Arts & Crafts-style sconces hang from chains to provide lighting to the room. The side walls of the sanctuary are filled with leaded glass windows. The large, domed central window includes 15 separate panels and each is flanked by twin 3-panel vertical windows. The rear of the sanctuary has a broad archway flanked by two columns. The archway serves as an entrance to an alcove backed by 6-leaded glass panels. The sanctuary retains its original oak pews with carved side panels and all are in their rich, original patina. There are 14 double and 7 single pews. A dais and choir loft occupy the front of the sanctuary. The entire area retains the original, rich, oak-paneled walls, 5-sided lectern and paneled altar railing. A short hallway leads to a small office, a choir room with built in bookshelves and the Fellowship Hall. This large room can be divided into 2 rooms with unique "tambour" doors in the style of a rolltop desk. The 2 rooms measure approximately 45' x 30' and 35' x 20'. The smaller room has sliding track doors which can convert the room into 3 small rooms. The flooring in the Fellowship Hall is wood tongue & groove. Across the rear of the Fellowship Hall is a kitchen with a 10-burner commercial grade "Garland" gas stove and lots of cabinets for storage. The basement is large, unfinished, and contains an older gas forced-air furnace. A paved alley runs behind the church, giving great access to the entire lot. This property needs updating and restoration. This property sells at "ABSOLUTE" Auction. Selling to the highest bidder, regardless of price. This is an exciting property for the right person or group. Take River Road west, 10 miles. Turn right at traffic light onto Gracely Drive. 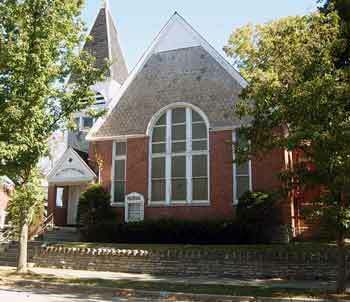 Church is on the right in the heart of Sayler Park. Follow signs.